This month's challenge at Elizabeth Craft Designs Blog is to create a project with a frame. Make sure you hop over to their blog to be eligible for a giveaway. For today's challenge Elizabeth Craft Designs is giving away a $20 Gift Card to use on their website to 3 winners. 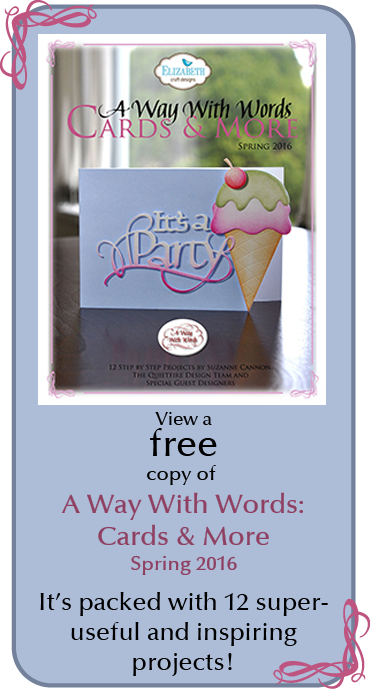 To enter simply leave a comment on the Elizabeth Craft Designs Challenge post and tell us What Elizabeth Craft Designs dies or stamp sets would you use to frame something on a card, scrapbook layout of home decor item? For this project, I chose the A Way With Words Flourished Oval Frame. And I was itching to play more with my Distress Oxides! I completed the framed sentiment with Susan Tierney-Cockburn's rose buds from Garden Rose 2. 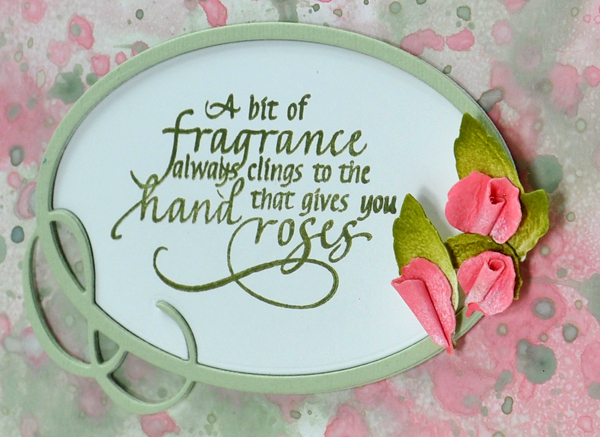 Did you know that all the quotes from the A Bit of Fragrance Collection come from Susan? I just lent my hand (literally) to the endeavour! Here is how you can make this card! Form a 7 x 5" tent fold card base from dark green cardstock. Die cut Flourished Frame from Specialty Stamping Paper once and twice from light green cardstock. Stamp sentiment using Pesto ink onto center die cut from the Specialty Stamping Paper version. Allow to dry. Create the background paper: Wipe one colour of Distress Oxide ink on a craft sheet, spritz it lightly with water and wipe a piece of Specialty Stamping Paper across the ink. Allow to dry. Repeat with the other colour. Allow to dry. Repeat several more times building up the colour until you are please with the result. Trim to 6 x 4". Mat with pink cardstock and adhere. Mat with white cardstock and adhere. Adhere these panels to the cardbase with foam tabs. Adhere all three Flourished Oval Frames together with a light green one on the top. Adhere the frame in the center of the card front as shown. Adhere the stamped sentiment in the middle of the frame. 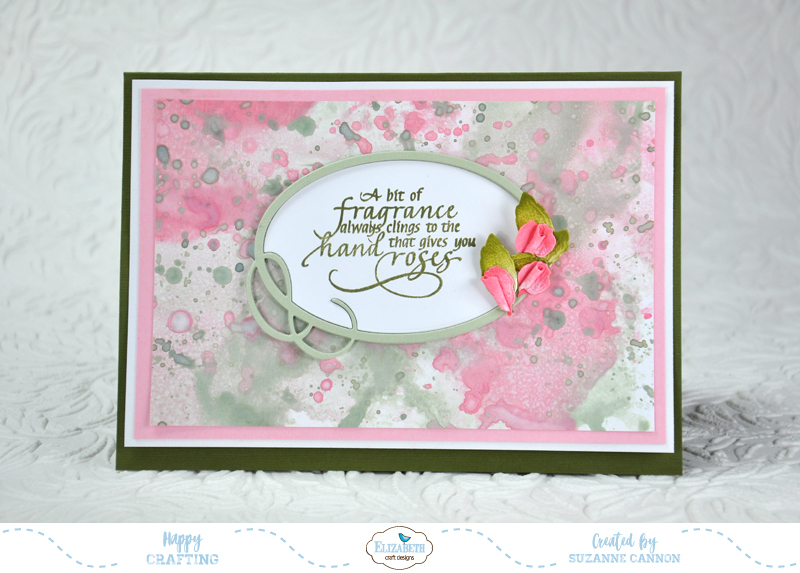 Create the rose buds as shown in Susan Tierney-Cockburn's video tutorial. (My buds and leaves were coloured with Distress Inks.) Adhere them to the Flourished Oval Frame as shown. Thanks for visiting! Don't forget to enter the giveaway at Elizabeth Craft Designs Challenge Blog Post! Good luck! I'd love to use the Entwined Egg die as a frame on an Easter card! Suzanne, this is so elegant and beautiful. I missed it before now. Good thing I get the email notices and eventually get around to opening them. That was interesting about Susan and the quotes. I love these rosebuds!